I’ve been thinking about about ‘framing rites’ for magical work, as contrasted with liturgical work. A part of the material I’m working on lately has been down-and-dirty spellbinding in a Celtic Pagan or Druidic context, as well as more ritualized forms of practical magic. Liturgical worship is the High Church end of Pagan work, using the tricks and skills of theatrical ritual to produce religious experience for a broad group of ‘villagers’ or Pagan congregation. However in cultures that accept application of spiritual skills for personal goals, such as Vedic or Hindu cultures, the style and form of liturgical rites are often used for full-production personal rites. The yagnas offered for the wealth or fertility of householders were Big Damn Deals, even though they were essentially just a spell. Our Druidry has its model of liturgical theurgy pretty clearly outlined and supported, and we’ve done some work on using it for practical rites. The question for me is how to translate that outline to personal work, especially to simpler works. It seems to me that from a folk magic perspective we see very little in the way of ‘opening and closing rites’ in the remnants of magic preserved into the 18th and 19th centuries. Now, to some extent I suspect this represents a mere loss of material from an earlier system that would have included some sort of opening rites. In the Christian magic of the Middle Ages there would have been at least the recitation of a prayer or psalm, by way of invoking the protection and blessing of ‘God’. There are various folkloric examples of using a circle, though it’s hard to tell how much the folktales or practices have been influenced by the more scholastic magic of the grimoires. In the Wicca I began in we would have chosen to ‘cast a circle’ for any formal spellbinding or magical event. The Wiccan circle-casting is an excellent centering and focusing spell, and certainly does the job of setting the magician’s mind into place for unusual states. I think that, for modern practitioners, such things are important. 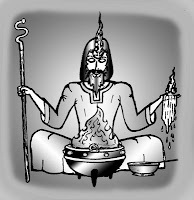 The ancients had their lifelong cultural immersion to produce just the right states of awareness for them as they approached a bit of strange ritual, or perhaps the methods of pre-ritual purification and focus and post-ritual close-down were the parts that didn’t get written down, and so didn’t get passed down as the European magical tradition became weaker. In any case I think it is helpful to moderns to have a set of opening rituals that help us move from common awareness into the mental place where we do magic. I do think that shorter framing rituals work better for those who are experienced in more formal rites. By working the full Order of Ritual, the full Druidic Fire Sacrifices we drive the meanings and images of the rites into our minds. Then when we work abbreviated rites we can draw upon those more powerful imprints to enliven the short words. In the hands of new students such short rites have the risk of distracting from learning the full depth of the symbolism. So, I have been slowly working to reduce our ritual elements to as short a set of framing rites as makes sense. In so doing I essentially abandon much of our traditional order of Ritual, in favor of a simple use of the Fire and Water, and a simple request for the aid of the spirits. Over the last years I’ve written progressively shorter Druidic framing rites – see the ‘Druid’s Circle’ in SFHW for an intermediate version. It seems proper to me to have various levels of complexity for various sorts of works. For example, as I write the first lessons of an Initiate’s Book for ADF, I find myself prescribing rather a lot of small rituals. The work of connecting with the Spirits, and making one’s set of tools, requires various customs to be established, and things to be blessed. I just can’t see why a householder Dedicant Druid would need to do quite that many full liturgies in the first month or two of the work. Of course those with a taste for it can certainly use the liturgical rites up through the Gate Opening as an opening for any working. However I’m not even sure that the Gate needs to be formally opened for small workings. When the point of the work is really to just purify and prepare, and to work with powers and spirits of the immediate local world, then I don’t see the Gate as crucial. So for simple framing for fast spells, or for bits of work in the woods or at the Shrine, I offer this shortest-ever opening and closing. Let the Druid have her Fire and Well tools, and whatever else she needs for the work at hand. • Work the Kindling Charm, or Two Powers centering. The Hearth and Well I hallow. By the Lord of Wisdom be hallowed. Blessed and made sacred to the work. For the Work of the Wise. To the Spirits, to the Shining Gods. • At this point the details of the work at hand are performed. And thus I end what was begun. Thus do I remember the work of the wise. I am surprised that you choose not to include a gate-opening. Granted I am really new to this kind of magic work but I have found that opening the gates really helps me focus on the sacred center. I have thought about that a lot, and written other shorty openings that include a gate opening. This one was created specifically to accompany purification rites. I still think that when all we're doing is using the general powers of Water and Fire for cleansing, and maybe laying a simple blessing on an object by our own word and will, the Gate isn't mandatory. For anything where we really mean to offer to the spirits and ask their return flow, I'd say it's closer to required.